One of the biggest tech stories of this year centers on a shift in the tech landscape. The hype that surrounds virtual reality is starting to fade. Bad software, hardware requirements, and the additional cost drove down sales. Now, thanks in large part to Apple, Augmented Reality looks like it will take its place. With Apple’s ARKit and Google’s ARCore, smartphones sold in the last two years will have enough processing power to run AR apps. Unlike VR, AR presents a lot of opportunity for marketers. With Augmented Reality, users only need to point the camera on the smartphone at any object. Users can then receive everything from promotions, sales, and special offers attached to that object. There is enormous potential for marketers not only with promotions but for recommendations. Another potential use for AR regarding marketing is to bring the physical store home. Furniture vendors can present any item they carry in your home. You can try a new kitchen layout, new chars, even a watch using AR. 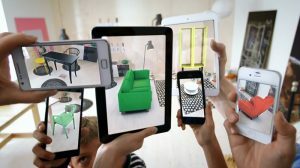 IKEA is one company that is working on AR and has a working app to test your furniture at home. Applications that use AR today are just the tip of the iceberg. The Augmented Reality space is ripe for innovation. As soon as Google and Apple enable the AR software, there could be as 500 to 600 million AR capable devices by the end of the year.